Ideal for those with an appetite for adrenaline, this 1-hour fast boat experience on the Thames River is sure to get your heart racing. See London’s sights the alternative way as you enjoy a leisurely cruise past Tower Bridge, the Houses of Parliament and the London Eye — giving you plenty of time to capture photographs and relax. Then, once you reach the fast zone, you’ll accelerate to a high velocity and listen to exhilarating music. Arrive at a meeting point on Westminster Bridge 30 minutes before your fast boat experience, in order to don a waterproof lifejacket and listen to a safety briefing. Then, board your speed boat and prepare for the fun to begin. At first, you’ll enjoy a relaxed ride down the Thames River. Take advantage of this leisurely pace and capture photographs of landmarks such as the Houses of Parliament, the London Eye and the Tower of London. Your guide will also point out important structures such as HMS Belfast and the National Theater. Then, once you go beneath the iconic Tower Bridge, you’ll enter the fast zone. Feel your adrenaline levels surge as your driver accelerates to a speed of 40-mph (35-knots) and you speed towards Canary Wharf. Scream with glee as you twist, turn and bounce over waves while listening to lively tunes. Then, catch your breath and return to your original point, where your tour concludes. Really enjoyed this tour! It’s a great idea to do some sightseeing combined with adrenaline! Staff was very friendly and responsible. We had the chance to see and learn a lot about all the sites until Tower Hill and then we started high speeding!!!! I would HIGHLY recommend this interesting and entertaining tour to everyone going to London looking for something different than an old school boat tour. Don't miss it! This was the best activity I've ever done in London! Jetting along at high speed and whizzing side to side along the Thames to James Bond music is an experience not to be missed!! highly recommend! A must do tour in London! River Thames Fast Boat Experience was just hilarious! Not to mention, seeing London on a completely different perspective than just visiting the main touristic spots... We passed through several bridges (Blackfriars Bridge, Millennium Bridge, London Bridge, Tower Bridge). Our captains were super fun and did a fantastic job accelerating that Boat! Woww that was fast! :) Luckily, we also experienced Tower Bridge opening up for a big ship to cross... That's was beautiful to see and definitely unforgettable... I definitely recommend this tour to anyone visiting London! What an incredible expereince! This Thames Boat ride combined sightseeing with thrills, so it was perfect for me and my friends. You get to see all of the famous London landmarks, including Tower Bridge, London Eye, BIg Ben etc, before going so fast and making sharp turns on the water. Absolutely amazing! I'll definitely be doing this again. What an amazing experience it was! The tour was entertaining, exciting and adrenaline fun! Staff were very friendly and the boat drivers Pascal and Lee were very friendly and entertained us with great music and explained about the sights plus even took a picture of us on Tower Bridge. 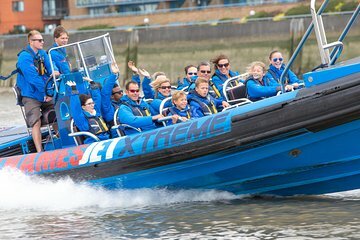 It was definitely a once in a life time experience that everyone should take this tour, as not only its a tour about London but also you get a adrenaline fun when the boat drives so fast! Absolutely loved the experience! I wasn't expecting that it's possible for a boat to go this fast on the Thames especially with all the sharp twists and turns. Bond themed music just topped off the experience and I could have happily done it over and over again. Definitely recommend! Great experience and so much fun! On arrival the staff were very friendly and helpful! Once on the boat we got to hear commentary and learn about the London Landmarks along the river. 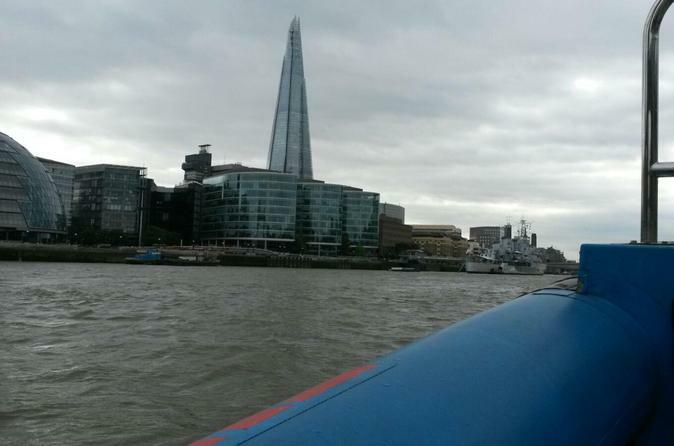 When we got past Tower Bridge the boat picked up speed- so much fun with all the twists and turns! I highly recommend this experience! Highly recommend this tour! It’s a great balance between sightseeing and a bit of adrenaline. The people in charge of the tour are very friendly, on time and make sure you will be super comfortable on the tour. You get life jackets and they also offer you coats in case you may get a little chilly. I have done the larger boat tours on the Thames before, but this one is way better as it is not crowded, there is only about 15 people max on the boat, which makes it a lot more enjoyable. You get to see all the sites since you cannot go high speed until you reach Tower Hill, so you have plenty of time to enjoy the view and take lots of pictures. It is also very safe once you reach the high speed on the boat and a lot of fun!